Prologue: Cold city -- RENT. The business of owning the city ; Making rent ; Hot water ; A beautiful collection ; Thirteenth Street ; Rat hole ; The sick ; Christmas in Room 400 -- OUT. Order some carryout ; Hypes for hire ; The 'hood is good ; Disposable ties ; E-24 ; High tolerance ; A nuisance ; Ashes on snow -- AFTER. This is America ; Lobster on Food Stamps ; Little ; Nobody wants the North Side ; Bigheaded boy ; If they give momma the punishment ; The serenity club ; Can't win for losing -- Epilogue: Home and hope -- About this project. "[The author] takes us into the poorest neighborhoods of Milwaukee to tell the story of eight families on the edge. Arleen is a single mother trying to raise her two sons on the 20 dollars a month she has left after paying for their rundown apartment. Scott is a gentle nurse consumed by a heroin addiction. Lamar, a man with no legs and a neighborhood full of boys to look after, tries to work his way out of debt. Vanetta participates in a botched stickup after her hours are cut. All are spending almost everything they have on rent, and all have fallen behind. The fates of these families are in the hands of two landlords: Sherrena Tarver, a former schoolteacher turned inner-city entrepreneur, and Tobin Charney, who runs one of the worst trailer parks in Milwaukee. They loathe some of their tenants and are fond of others, but as Sherrena puts it, "Love don’t pay the bills." She moves to evict Arleen and her boys a few days before Christmas. Even in the most desolate areas of American cities, evictions used to be rare. But today, most poor renting families are spending more than half of their income on housing, and eviction has become ordinary, especially for single mothers. In vivid, intimate prose, Desmond provides a ground-level view of one of the most urgent issues facing America today. As we see families forced into shelters, squalid apartments, or more dangerous neighborhoods, we bear witness to the human cost of America's vast inequality-- and to people's determination and intelligence in the face of hardship. 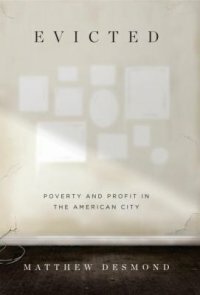 Based on years of embedded fieldwork and painstakingly gathered data, this masterful book transforms our understanding of extreme poverty and economic exploitation while providing fresh ideas for solving a devastating, uniquely American problem. Its unforgettable scenes of hope and loss remind us of the centrality of home, without which nothing else is possible"--Amazon.com. Think Nickel and Dimed of the 2010s submitted by christinacz on July 13, 2017, 4:07pm Evicted is to 2017 what Nickel and Dimed was to 2001. It's the same core idea--about the inhumanity of structures of economic inequality delivered as intimate stories of people who are struggling to make it in America. It exposes the rental housing market of one Midwest city (Milwaukee--but it could be anywhere) as one bar in the cage that traps families in poverty and perpetual instability. Matthew Desmond is a sociologist who can tell stories, much like Barbara Ehrenreich. You'll feel for the people, follow their ups and down and wish it could all be different. You'll flip to the end notes that star each chapter, delving into the policies and history that created housing systems that exploit poor people and place landlords in declining cities in economic and ethical binds. It was my favorite nonfiction book of the year, and I didn't stop reading until I had finished (over the course of about 4 days). Read it (put it on hold). Made for a great book club discussion submitted by sueij on July 21, 2018, 10:27am An outstanding book written in an easy-to-read style that explores both personal and systemic views of housing and evictions in Milwaukee, WI. The author follows eight people, both tenants and landlords, some families, some single, who face different kinds of challenges. He looks at visits to the courthouse for eviction hearings from both sides of the hearing (tenant and landlord), he watches who gets extensions on rent and who doesn’t, and how children play into the equation. We read this for my book club, and had an absolutely fascinating discussion about it. Many people found the *content* to be emotionally difficult and hard to read. As a social worker who has worked with children with disabilities on Medicaid and in homeless shelters and soup kitchens, there was little content that surprised me. I loved this because it rounded out the knowledge I already had. For many, it was eye-opening to the point of needing take breaks and come back to it. We had an interesting discussion about whether the renters needed to “pull themselves up by their bootstraps” more than they did, and most of us identified systemic issues as barriers. An utterly fantastic book to read on your own or for discussion with others. New York , NY : Crown Publishers, 2016. Description: x, 418 pages ; 25 cm.